A common question I see popping up in forums and groups for people with chronic health issues is “how do I stop myself from going crazy with boredom/frustration/loneliness/anger/sadness?” It can be a problematic issue, and it is a catch 22 situation. You feel so unwell because your body is sick, so you inevitably miss out on more and more in terms of socialisation, work, chores, physical exercise and activities; normal life! So then in resting your body and trying to heal, you find yourself feeling lonely and frustrated, which then makes you feel worse. It is a vicious circle. The best thing for your body while it heals is to find things to do that can keep your soul happy, your mind active and your body moving within its limits. These are some of the things that I have found to be effective. I will post 5 today, and another 5 on another Wellness Wednesday. 1. Find a hobby: Take this opportunity to turn a bad situation into a good one; do something that you haven’t had chance to do before. 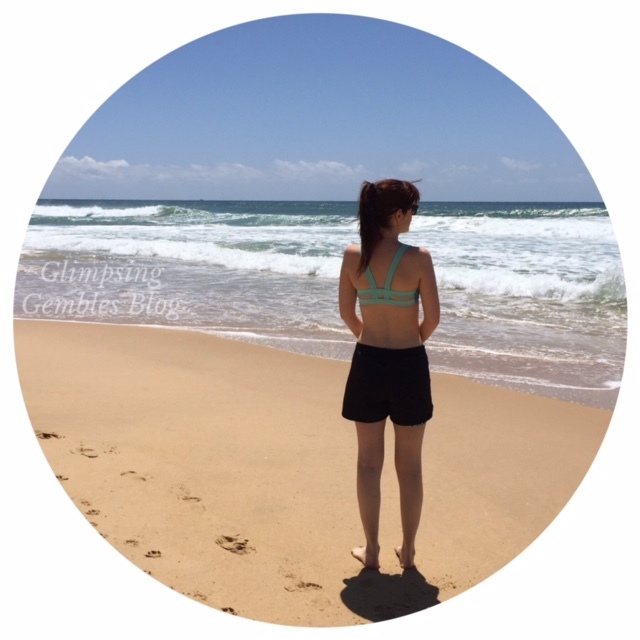 For me, I have dived into paper craft, scrapbooking, memory keeping and photography in a big way, and I am loving it! Find something that is within your body’s current physical capability (for example, scrapbooking is great because you can sit in a comfy chair or even lie down with a tray table across your lap and relax, but still be doing something with your hands and mind). I love to listen to audiobooks because I am an avid reader, but find physically reading too taxing most of the time (Audible is an awesome site for affordable, online audiobooks). Try painting, or decorate a mug or a pillow, do some cross stitch, play chess with a friend, play a gentle instrument, learn the rules and strategies of a sport on tv such as cricket or the formula 1, try your hand at writing, sewing, or gentle gardening. 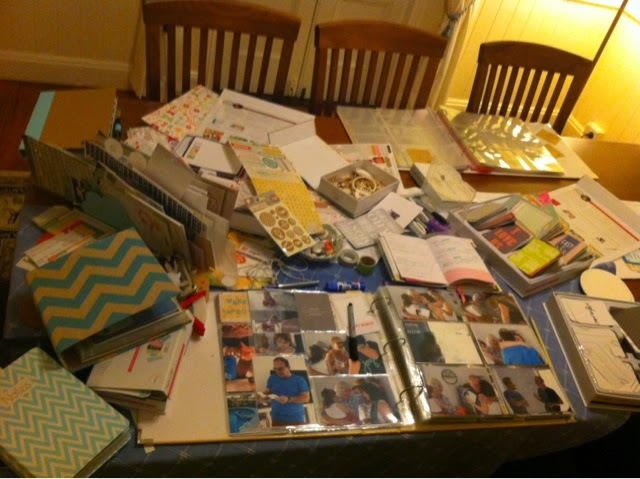 Creating a crafty mess while scrapbooking…. 2. Move within your limits. Physical activity can be out of the question for a lot of people with chronic health conditions. It is important to move within your capabilities. Try hydrotherapy, or go for a walk around a plant nursery, or a park, or your lounge room, with your support person. Maybe yoga or pilates will suit you, or a gentle session with a personal trainer. Always check with your doctor first, but just because you can’t do some things, doesn’t mean you have to totally stop moving. It will be good for your health and your mind. I use a fitbit to see my daily step count… I talked more about this in a post here. 3. Change your location. It is very easy to get stuck in a rut, staying in bed or on the same couch, day in, day out when you are sick. When you can, try to spice it up a little! Go and sit on someone else’s couch. Go away to your favourite nearby location with family or friends, such as the beach, and rest in the place that makes you feel positive. Leave the stir crazy feeling of being in the same room day in, day out and enjoy a few days healing in your happy place. Invite friends over for a cuppa in the garden, but be open about your time limits and your need to rest. Take a blanket to the park. 4. Freshen up. Sometimes looking in the mirror to see a weak body with tired, dark bags under your eyes, and ghostly pale, dry skin and messy, limp hair can make you feel down right miserable! Not in a vain way, but in a loss of motivation way. So liven up the outside a bit, and it might help the inside! Paint your nails. Put a little make up on. Get a friend to brush your hair and put it up differently. Put on a nice outfit. Put some aftershave or perfume on (if you can tolerate it). Get some help to shave your beard or legs. Moisturise. Coat yourself in coconut oil. Use a natural face mist. Exfoliate your skin. Have a bath (try Epsom salt, and natural essences). Visit the hairdresser. Have a facial or a massage. Find something that will help make you feel a little more human. 5. Play with animals. It is well known that being with animals is amazing therapy. Dogs are often brought into hospital and care situations for this reason. They uplift the spirits, make people happy and give unwell people company. Not only is being with an animal good for your soul, but caring for them, such as brushing their hair, or playing gently with them or taking them for a little walk, is exceptional physio for unwell people. If you are lucky enough to be able to get an animal, it will do wonders for you. Make sure that you take in your abilities when you choose the animal. Don’t choose a large, active dog when you can only walk around the block. If you can’t have an animal, visit a dog park, and watch the dogs playing. Look after friends’ animals, or volunteer at a shelter. Find someway that you can have contact with the inspiring, loving and motivational characteristics of animals. This is my neighbour’s dog. He is happy to have the company too! I hope these ideas help you, and give you a few new things to try. Keep your chin up and keep smiling.